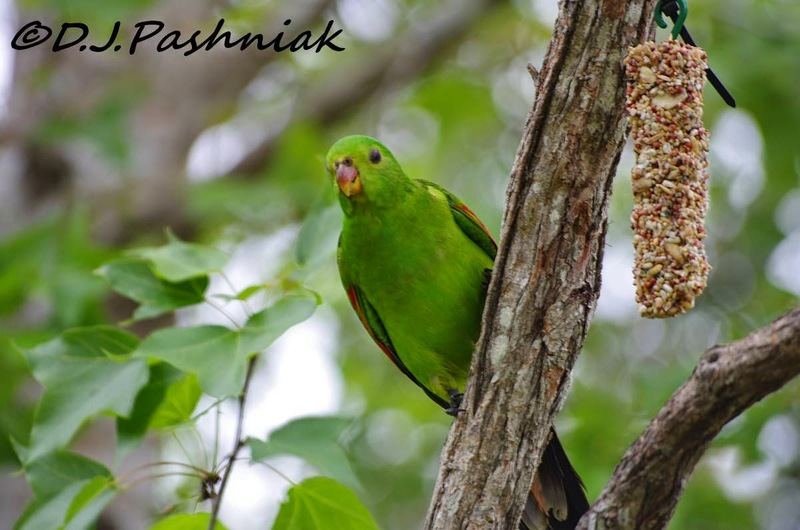 Most parrots around here are easy to see and hear - but a green parrot against green leaves is not so easy. 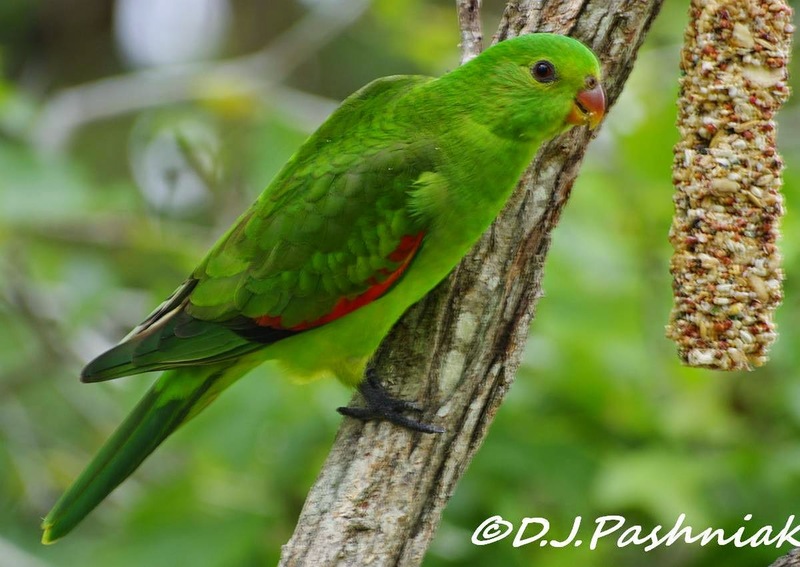 Red-winged Parrots often fly over my place but they seldom come down and stop in the trees. Friends who live a few blocks away from me have started hanging out a seed "bar' for the Red-winged Parrots that are around their place. 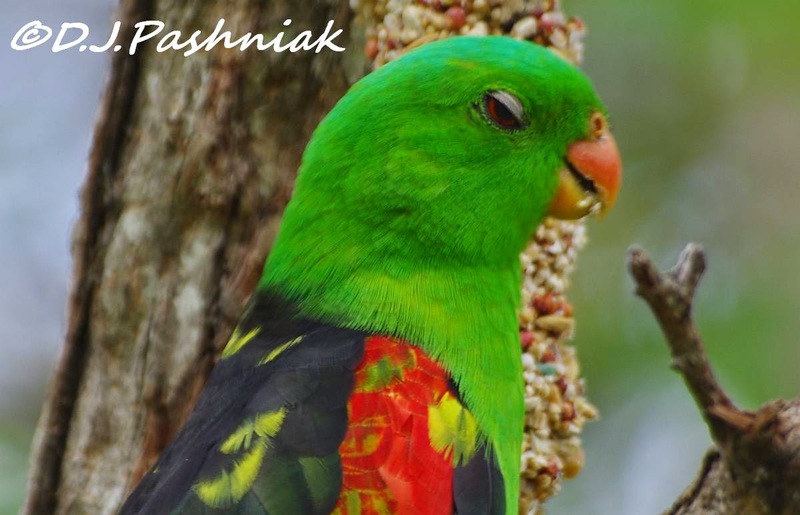 However, as soon as these parrots have finished eating they take the seeds away - otherwise the big White Cockies simply pick it up and take it right away. Females and immature males are green with just a thin stripe of red down the side. They are the hardest to see against green leaves. Males have a much wider piece of red color on their wings and are black down the back. This male was even prettier. I am told it is a young male still showing some immature feathers. This is the female again. This photo reminded me of all those times someone will ask to have their photo taken again because they blinked at the wrong time! Oh, I do love your COLORFUL birds, Mick! And your captures are superb!! Thanks for sharing!!! Have a great new week! Oh wow, they are gorgeous birds. I love their colors.. The red really stands out! Awesome shots.. Have a happy week! 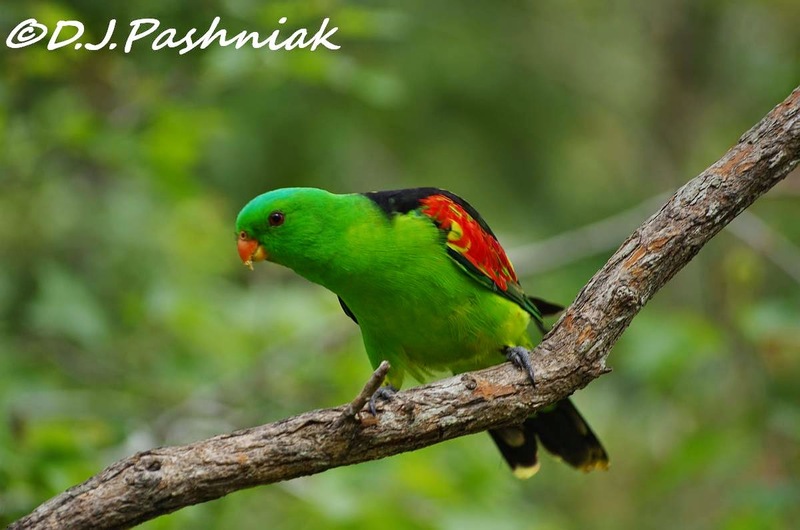 Gorgeous parrots and wonderful photo shots for OWT! Thanks! These are great images, and the bird is beautiful too. Wishing you a great week. So pretty and yeah that one needed a retake! You have amazing backyard birds. What delightful creatures and great shots! I know they are really noisy but they are a delight to watch. Lovely photos. Parrots always seem to me to have a look of mischief on their faces. Gorgeous birds! I love the last shot. Can imagine that they are well camouflaged in trees; great photos. That is a hell of a good looking bird. Oh these are marvellous captures Mick! Stunning colours and beautiful details. 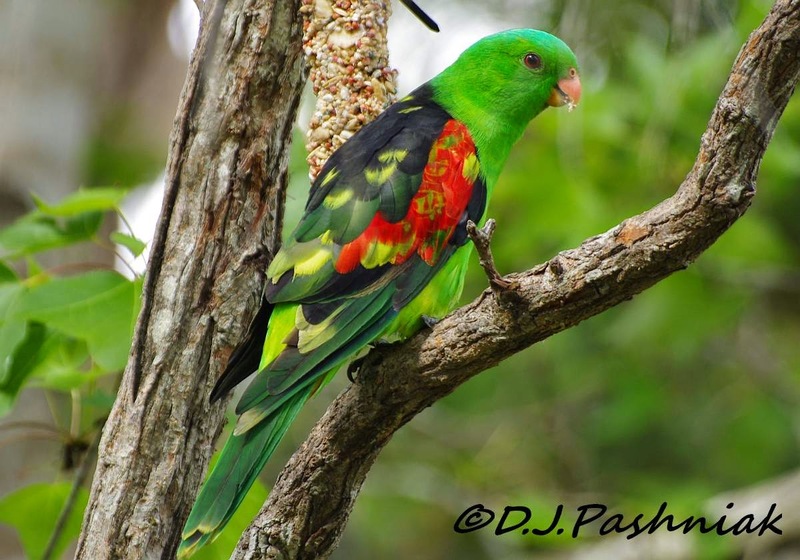 Beautiful captures of this lovely, bright parrot that I have as yet had no chance to see for myself. I love that last shot with the green head and neck feathers like a helmet over the rest of the plumage. The male certainly is spectacular. Oh how gorgeous!!! That is one beautiful bird, both male and female. Lovely photos! That is a gorgeous parrot! The colors are incredible. I know what you mean about green on green. Tricky to capture on camera. This is a new parrot for me. It seems like Australia and surrounding places are home to quite a variety of them! I see how they blend in when all you see is green, but, wow, once that male turns around seems like he would be hard to miss! Terrific photographs, Mick! Wow this is such a colorful bird. I would so love having these in my back yard. Exciting colors on these two! Great shots. it's back gives it away. beautiful green. What a beautiful parrot. If anything the young male is even more extraordinary with the mix of feather generations. You ask a good question about foxes. Foxes have never been popular with farmers in the countryside, the fox's natural environment and the animal has always been controlled in that way. In recent years the Fox has become urbanised, visiting gardens where people feed them and also feeding off human waste in the dead of night and early morning at KFC and McDonalds etc, so their population is very high. Where birds (partridge and pheasant) are released for "sport" the animals come into conflict with shooters who invest large sums of money into their sport and will consequently try and control fox numbers also. The male is positively amazing - the red feathers are reminiscent of a beautiful Oriental kimono.